The overall plan presented in the proposal is well balanced. All the elements and components are carefully considered and meet the objectives of the brief. The boulevard is perceived as a compact urban space flanked by buildings. The block models have been skilfully fitted into the location. The blocks are successfully sequenced based on the surrounding urban tissue. Access to the sea is provided to link the local centre to the bay. The price to be paid for this is that rock needs to be cut from the hill, but the benefits outweigh the losses. The proposal is also carefully thought out and sure-footed in terms of traffic arrangements. The tramline to be constructed in Kiiltomadonraitti Street has been integrated into the proposal. It provides a natural link from the competition site to the area east of the centre. At the intersection of the boulevard and the tramline, a central urban space is created which also offers a welcome break along the relatively long boulevard. The tower in the north next to the bridge creates a fine point of entry to Laajasalo. At the bay, the elongated, slightly undulating chains of buildings turn to form a right angle relative to the boulevard. This solution offers a view of the sea from the buildings, pacing the exteriors facing the street. While the block model created by this approach is highly functional, it is also somewhat generic. The urban structure and architecture are not derived directly from the properties of the competition site, even if skilfully and faultlessly executed as such. The details complement the overall plan nicely. The ground floor urban synergy concept meets the brief’s objective regarding the integration of production into the urban tissue. The proposed functions really make room for small shopfronts and residential offices. The question is whether these facilities are sufficient considering the number of residents. From this standpoint, the street view in its urban dynamism is exaggerated. 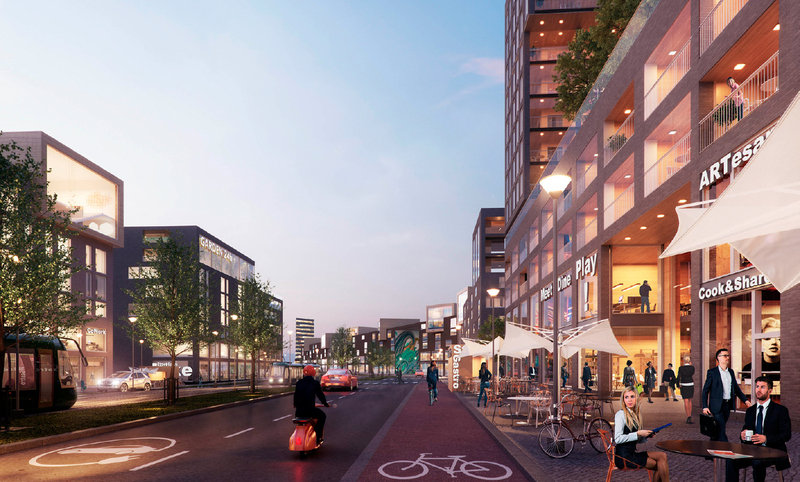 Although Laajasalo will have a new centre, activation of the boulevard along its entire length on this scale appears idealistic. However, the proposal can be developed further flexibly within the limits of the concept. The block typologies including the floor plans of the flats have been presented well. They are functional, even if they fail to offer any novelty value. The proposed zone structure and flexibility are also well executed in the typical lamella houses. The plan does not offer new, unconventional concepts or ideas of how to integrate co-managed planning into the process. Its strength lies in a thorough analysis of the problems associated with living and building along a boulevard. 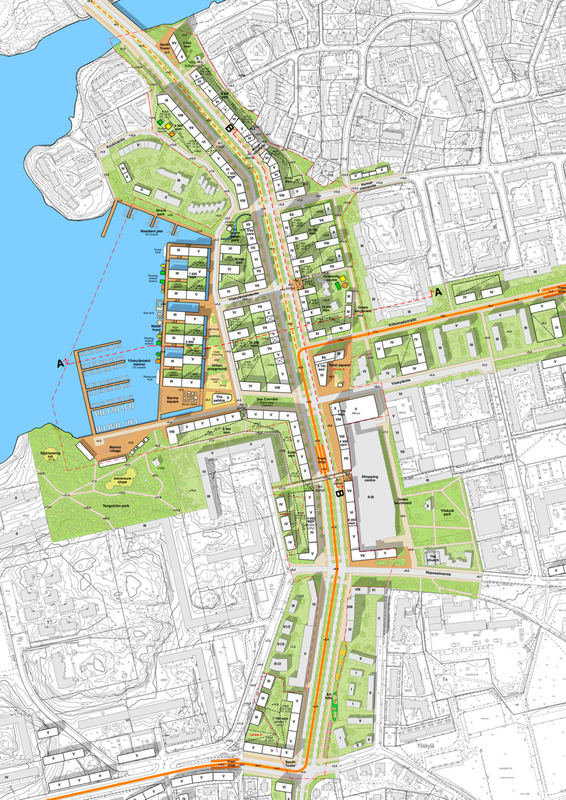 The objective of the master plan is to create a vibrant and productive urban boulevard with a strong connection to the sea. The plan patches together the urban structure of the existing surroundings and the already planned additions. 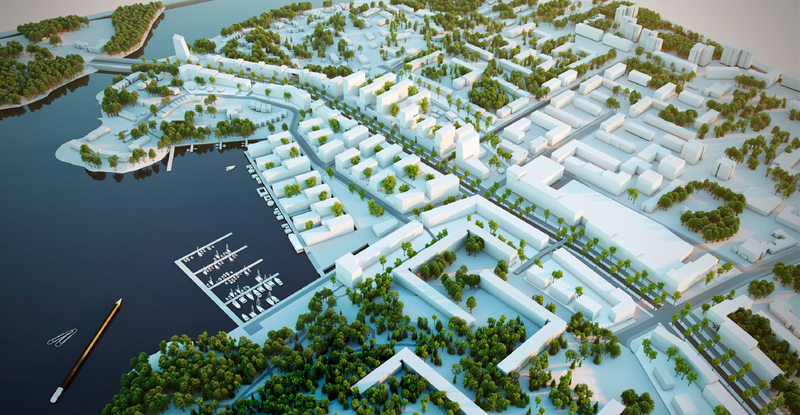 The proposal offers a toolkit of design solutions and boulevard strategies that can be applied anywhere along the Laajasalo boulevard and beyond. The Yliskylänlahti area is a variation of the ”block” structure of the existing Yliskylä centre. The east-west placement and the gradually rising heights of the buildings allow long views towards the sea from the street and the apartments on both sides of the boulevard. The same urban structure also helps to ventilate the boulevard. A small coordinate twist in the urban grid creates a connecting axis from the sea to the new shopping centre. The axis leads from the Twist square to the central public spaces of Yliskylänlahti: the Marina Square and the Urban Playground. In the middle is the Pebble: an icon building combining public and commercial activities. The Yliskylänlahti Marina and the Marina Village are located next to the Marina square to the west. All the public spaces of Yliskylänlahti are connected with the Shore Route passing along the coastline. The Waterfront serves as a parallel path for the Shore Route. The northern and southern parts of the boulevard take a systematic but playful approach to the somewhat inevitable ”stripe” layout protecting the housing from the noise and pollution. From terraced houses to rooftop apartments and moderate high-rise buildings the proposal gives solutions to various urban contexts and terrain conditions. The “boulevard modularity” system allows the creation of multiple housing combinations for multiple dwellers. The “Urban Synergy” principle offers a strategic solution for productive use of the ground and first floors along the boulevard. The ”Co-work hotel” gives businesses a way combine their resources and know-how for more efficient productivity. For a regular resident urban synergy can be applied as a flexibly modified ”Shared Space Studio” offering people possibilities to use their skills and know-how for larger benefit. The overall amount of square metres for the competition area is 179 000 k-m2, of which 157 000 k-m2 is housing, 12 000 k-m2 commercial spaces, 8 000 k-m2 workplaces and 2 000 k-m2 public buildings. Except for the shopping centre parking house all parking has been placed under decks. Tämä vaikuttaa suunnitelmista urbaaneimmalta, rakennettu tiiviisti lähelle katua ja vaikka en usko havainnekuvan elävään katukuvaan niin se on silti kaupunkimainen. Korkea talo tuossa heti sillan jälkeen toimii vähän kuin porttina Laajasaloon ja näyttävänä maamerkkinä. Rannan puolella näkisin mielelläni hieman urbaanimpaa rakentamista joskin ilmeisesti tässä on ideana, että rakennukset ovat nousevia rannasta päin tultaessa. Kadun viereiset talot voisivat olla siltikin umpikortteleita ja rannassa olevat sitten matalia rakennuksia niin maksimoidaan merinäköala-asuntojen määrä. Pilvenpiirtäjät tai muuta olemassa olevaa rakennuskantaa korkeammat rakennukset eivät kuulu Yliskylään ! Vesi kantaa ääntä varsin tehokkaasti. Miten ylimääräinen liikenteen ja muu melutaso pidetään kurissa ? Rakennusten design on tylsää neliskanttista ja aivan liian modernia ympäristöön nähden. Tämä ei ole ainoastaan tämän ehdotuksen ongelma. Haettaisiin mieluummin vaikutteita jugendista ja funkkisesta. Idyllinen vanhakaupunkimiljöö kahviloineen ja terasseineen houkuttelisi ja elävöittäisi enemmän. Jälleen rakennusmassaltaan ympäristöönsä nähden aivan ylimitoitettu. Ei kiitos! Tengströmin puisto on ikävällä tavalla reunustettu kivitaloilla ja varattu osin venesataman alueeksi. Rakennusmassa on ripoteltu pitkin bulevardin vartta, joka on hyvin triviaali ratkaisu. Luovempiakin ratkaisuja täältä löytyy. Olen samaa mieltä edellisen Hannun kanssa siitä, että bulevardin varsi tuskin tulisi olemaan vilkkaassa käytössä (ainakaan tällaisenaan). Se on ollut yksi “mainoslause” jota hankkeen ympärillä on toistettu väsyksiin asti. Minä en henkilökohtaisesti istuisi esim. Mäkelänkadun varrella olevassa katukahvilassa mistään hinnasta. Helsingin nykyisen Bulevardin liikennekään ei ole sillä tasolla, että sen varrella viihtyisin. Pohjois-Espan liikennettä pyritään rajoittamaan kävelykaduksi – sekin on ilmeisesti liian vilkasliikenteinen kadunvarsi cappuccino kupillisen ajaksi. Miten sitten Laajasalon pääväylä ja ainut autoliikenneväylä olisi yhtään sen miellyttävämpi ympäristö mainoslauseista ja havainnekuvista huolimatta? Tämä ehdotus on suorastaan yli-urbaaninen, joka pilaisi täysin Laajasalon identiteetin (sen, joka syntyy siitä, että Laajasalo on saari, jossa luonnonläheisyys , vehreys ja merellisyys ovat sen todellisia vahvuuksia). Ehdotus sisältää todella massiivista uusrakentamista ja todella korkeaa pilvenpiirtäjää ”maamerkiksi” sillan kupeeseen. Nämä eivät sovi lainkaan Laajasaloon. Ehdotettu kaupunkibulevardi olisi varsinainen häkä- ja melutunneli, joka vaarantaisi sen varrelle muuttavien asukkaiden terveyden eikä todellakaan houkuttelisi asiakkaita bulevardin kivijalkakauppoihin tai kahviloihin.